Glass must meet a specific safety standard in order to prevent injury. There are several ways to prevent glass from breaking, one of which is to install safety film to the glass. By installing safety film, your glass will comply with BS EN 12600 (previously BS 2602), which will satisfy most insurance requirements and increase the safety of your workplace. Safety window film is a tough and durable laminate that prevents glass from breaking. It can be applied internally, externally or both to increase the strength of the glass, but if broken the safety film holds the broken glass in place, preventing injury or damage to nearby property. If unprotected glass breaks, the shards fall away from the frame creating an immediate and dangerous hazard. By Installing safety film your glass will comply with BS EN 12600 which eliminates the need to buy expensive safety glass to ensure safety standards are met. It is a legal requirement that glass in 'critical locations' must meet relevant safety standards. 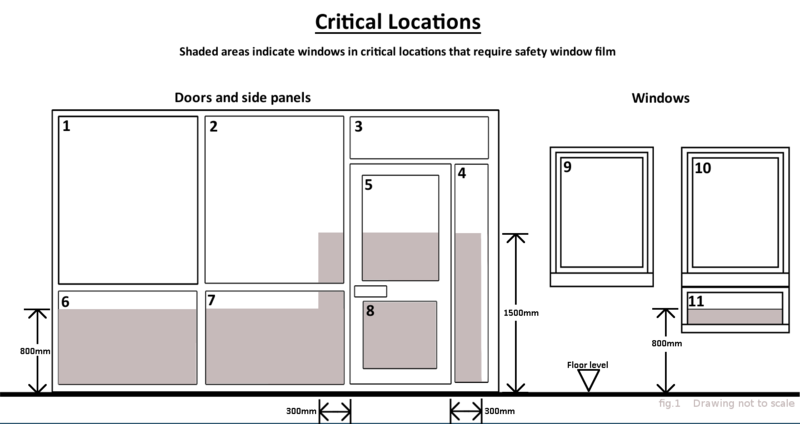 These critical locations are set out in Building Regulations Approved Document K (England and Wales) and Scottish Building Standard 4.8.2 (Collision with glazing) and are shown in Fig.1. Mr Tint's experienced installation team cover the whole of the UK and are able to install film internally and externally. Whatever the size and shape of your building, our staff are fully qualified by IPAF and hold Powered Access Licenses (PAL), allowing us to tint any hard to reach windows. To find out more about our safety window films and how they could benefit you, please contact our friendly and professional team today on 0141 550 8282 or drop us an email at info@mrtints.co.uk. Our fully trained staff are always happy to discuss your requirements and suggest the best possible solution for your situation.